Get ready for the most amazing toy of Batman's Tumbler from Christopher Nolan's Dark Knight trilogy of movies based on DC Comics' Batman comic book series! A remote-control version of the Tumbler Batmobile, this absolutely incredible product features a moving spoiler plus opening and closing cockpit door that are both controlled by phone app, and even an app-controllable Jet-Power mode to boost up speed by 30% with movie-like red and blue LEDs and jet-power sound effects! With 11 light-up LEDs in the cockpit, sound effects, and even an adjustable 480p night vision camera that gives you a first-person look of what it's like to drive inside of the Tumbler, this is truly one of the most detailed versions of the Tumbler ever made! Complete with advanced technological functions including path recording and replay function along with voice intercom functions, you'll be able to use the camera to snap photos or record videos. Use the Driving Mode app whose interface has been designed after the Tumbler driving board in the movie or the Attack Mode app interface that imitates the driving board as seen in the film during the Tumbler's Attack Mode! This version of the Tumbler has been put together using approximately 600 component pieces and 25 high-power LED lights and includes a 2100mAH Lithium-Ion batter that provides 1 1/2-hours of play time after 40 minutes of charging. 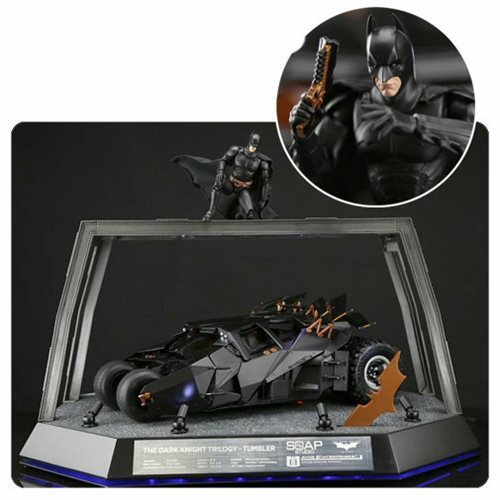 The Tumbler comes complete with a high-density polyfoam protection bumper, a Gotham City diorama base charger with 8 adjustable LED lights that have "Neo-Sensor" motion detection remote-controlled on/off functions, a die-cast metal Gotham City Drain Cover, and a Batarang-shaped remote control. Plus, this awesome Tumbler replica includes a 1:12 scale Batman Figure ( Batman Begins version) that has 36 points of articulation, additional weapons, 9 interchangeable sets of hands, a normal cape, and a plasticity cape! Ages 13 and up.